REPURPOSING PLANNED – This building at 211 Wood St. is on tap to become the home of the city’s first cannabis retail sales outlet. 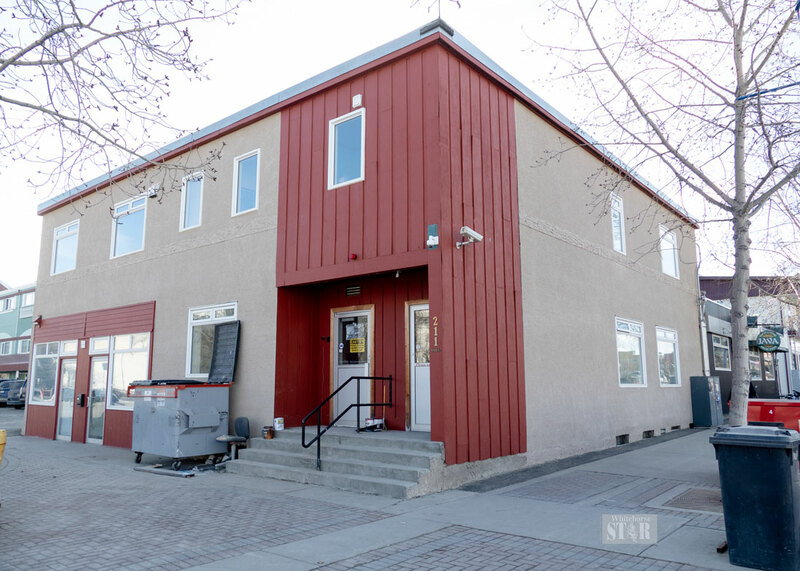 Jordi Mikeli-Jones and Jeremy Jones expect to have Whitehorse’s first private retail outlet for cannabis open downtown on Wood Street a week from Wednesday – April 17. The couple was noticeably pleased, if not joyful, Monday evening as city council approved amendments to the zoning bylaw that open the door for the private sales of cannabis in specific areas of the downtown. In an interview outside council chambers after the amendments were approved, Mikeli-Jones said they expect to have their required development permit and business licences early next week in time to be open next Wednesday. Jones pointed put they’ve already spoken with the Yukon Liquor Corp. about what they expect their first order of pot will look like. The corporation has the authority over cannabis sales, just as it has power over the sale of alcohol. “We open on April 17 in advance of 4-20,” said Mikeli-Jones, in reference to the internationally recognized day of tribute to cannabis on April 20, when pot enthusiasts traditionally light up at 4:20 p.m.
After the council meeting wrapped up, while Mikeli-Jones and Jones were still talking to reporters in the hallway, Mayor Dan Curtis came out and hugged both of them. The mayor said a lot of people feel city council took its time to give careful thought to private sales in the downtown core, and he agrees. “I think we did a good job,” Curtis said. Mikeli-Jones said they are relieved and excited, and feel there’s been a meaningful public discussion about private sales. The couple plans to open up Triple J’s Canna Space at 211 Wood St., in the old Yukon News building, at the corner of Wood and Third Avenue. Jones said they expect to be selling their cannabis below the retail prices the liquor corporation has established for its outlet on Industrial Road. They will have 12 staff employed, he said. Mikeli-Jones said their hours of operation will be from 10 a.m. to 8 p.m. Monday to Thursday, from 10 a.m. to 9 p.m. on Friday, 10 a.m. to 8 p.m. on Saturday and 11 a.m. to 5 p.m. on Sundays. Staying open any later increases the likelihood of having to deal with individuals who are intoxicated and must be refused, so it’s just not worth it, Jones suggested. Mikeli-Jones said they are quite confident they’ll get the necessary permits and licences to open on April 17. City council has indicated that while it wants to keep the initial retail outlets in the downtown area, it will be open in the future to looking at expanding the allowance for outside the downtown. John Streicker, the minister responsible for the liquor corporation, has said it hopes to close its retail outlet this fall, but will still be taking orders and mailing out cannabis through its online store. There is only one other active application before the cannabis licensing board for a retail outlet downtown. Ninetails Cannabis Inc. has applied to open a store at 204 Main St., between Second and Third avenues. City council approved four amendments to the zoning bylaw Monday. There was an amendment to firm up the definition of what is meant by playground equipment, as there is a requirement for a 100-metre buffer between cannabis retail outlets and playgrounds or parks with playground equipment. They also clarified the requirement for a 100-metre buffer between retail outlets, and how a retail outlet will be established upon the issuance of a development permit. There was also an amendment requiring the city to provide maps of all locations requiring a 100-metre buffer. “Implementing buffers around child care centres would significantly limit the permitted area for the retail sale of cannabis,” says the administrative report presented to city council. “Allowable areas would then be limited to three small areas which could create clustering of stores. Coun. Laura Cabott did propose and did receive support for a last-minute amendment which expanded the prohibited area south of Main Street between Fourth Avenue and the clay cliffs. The amendment still allows for the sale of cannabis from Fourth Avenue lots, but removes the line of lots directly behind the Fourth Avenue lots. Cabott told her council colleagues that the downtown area south of Main Street is almost all residential, just like Old Town north of Main Street, from Sixth Avenue to the clay cliffs. It’s much easier to expand the allowable area in the future than it would be to reduce it once it’s been approved, she said. Cabott said it’s best to take a slow, cautious approach to the very new cannabis retail industry. Much of the Old Town is also off limits. City council also passed an amendment to its business licence bylaw which prohibits any sales of cannabis beyond 10 p.m.
Yukon government regulations permit private retailers to stay open until 2 a.m. In bringing forward the amendment, Coun. Jan Stick told her colleagues that permitting cannabis sales from 9 a.m. to 2 a.m. just didn’t make sense to her. Stick said she was planning to ask MLAs to consider imposing the same 10 p.m. restriction across the territory, and not just for cannabis, but also for the sale of alcohol at offsale outlets as well. Just a thought, that brickish colour should be painted light green and there should be pot plants and leaves painted on it. I remember not long ago there was a little shop kitty corner to where the bud shop is going and that little shop sold chips and pizza slices and soda and beer and wine but the downtown business people lost their minds and railed and screamed and that kind little shop owner closed his business because he didn't want to the subject of constant scorn. So. Is that what we can expect again? If so I want the city to have an anti-harassment policy and practice in place for this kind of thing. Oh boy, I can hardly wait for the City to put the Mary-Jane symbol painted at the intersection of Wood & 3rd. Government profits go into healthcare and social programs while private profits go into bank accounts. And we thought that there would be any different outcome? So the business in question purchased, renovated and furnished a building before zoning was even through or finished with public consultation. Has to be one of the first businesses that I know of that can get their development and building permits within a week. It’s been no surprise as the idea was to have the store open for 4/20. Apparently that’s more important than approaching this issue with the proper care and thought. Hey, but congrats to the new business and I’m sure it will be a successful one. I just wish all businesses received the same effort from our city officials. This is an example of council making the right decision. I am not sure about it's proximity to the park or to the Wood Street school but my perspective is that it's not a significant concern. Coun. Jan Stick is correct that permitting cannabis sales from 9 a.m. to 2 a.m. just didn’t make sense. I agree with her that the 10 p.m. restriction across the territory for cannabis should also apply to the sale of alcohol at offsale outlets as well. Why does council even bother us with consultation when they do whatever they want anyway. This City has lost its meaning.